With this simultaneously harrowing and lyrical debut feature, Jan Nemec established himself as the most uncompromising visionary among the radical filmmakers who made up the Czechoslovak New Wave. 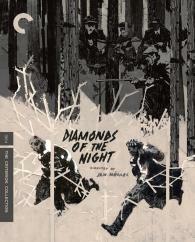 Adapted from a novel by Arnošt Lustig, Diamonds of the Night closely tracks two boys who escape from a concentration-camp transport and flee into the surrounding woods, hostile terrain where the brute realities of survival coexist with dreams, memories, and fragments of visual poetry. Along with visceral camera work by Jaroslav Kucera and Miroslav Ondricek—two of Czechoslovak cinema’s most influential cinematographers—Nemec makes inventive use of fractured editing, elliptical storytelling, and flights of surrealism as he strips context away from this bare-bones tale, evoking the panicked delirium of consciousness lost in night and fog.